There are four ways that we usually communicate our thoughts, feelings, and needs to others. 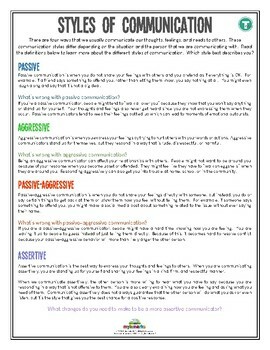 These communication styles differ depending on the situation and the person that we are communicating with. Read the definitions below to learn more about the different styles of communication. Which style best describes you? Mylemarks is your destination for therapeutic worksheets and resources for kids and teens. Our resources cover topics such as anger management, anxiety, bullying, social skills, hygiene, and much more! ​We work hard to create comprehensive materials for parents and professionals to use in the home, school, office, and community. ​Our goal is to develop creative products that promote healthy social and emotional development in all children and teens. Don’t forget to Follow Us on TPT to stay current with our products! Sign up for our mailing list on our website to receive FREE resources straight to your inbox on the first Friday of every month as part of our FREEBIE FRIDAY giveaway!